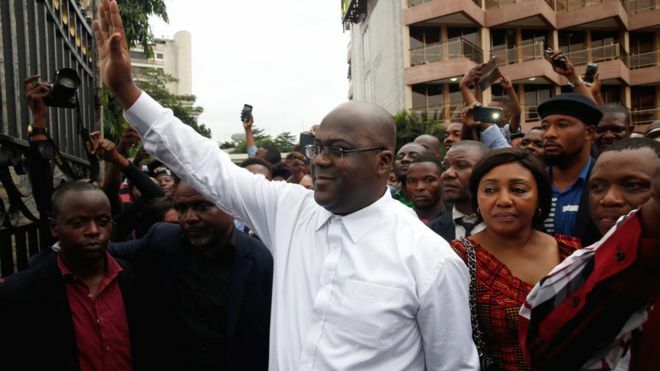 KINSHASHA – The Democratic Republic of Congo President Felix Tshisekedi says his country is willing to join the East African Community (EAC) to deepen its economic ties with the region. Speaking when he met President Uhuru Kenyatta of Kenya at State House Nairobi, Tshisekedi, who was declared the winner of the disputed vote where his competitor Martin Fayulu claimed he was the people’s favourite, added that the expansive country would benefit more if it was a member of the EAC. The two agreed on strengthening bilateral relations between the two countries with Kenyatta offering to train Congolese public servants in Kenya, reports the East African paper. Citing the importation of goods to DR Congo through Kenya, President Kenyatta called for the deepening of trade ties to boost the two countries’ economies. The President observed that a lot of Congolese imports passing through the port of Mombasa are goods destined for Goma and Lubumbashi which is the eastern part of DR Congo. The DR Congo President was on a three-state maiden tour and he arrived in Nairobi on Wednesday afternoon after visiting Angola and before heading to Congo Brazzaville in the next leg of his tour.